The Arboretum greenhouse is warm and alive this time of year, beginning to fill up with stock for FloraKansas Native Plant Festival. FloraKansas is our largest fundraiser, and takes a lot of prep work. Luckily, I relish my time spent time in the greenhouse, so it is a welcome change of pace from the snow-shoveling and office work of winter. 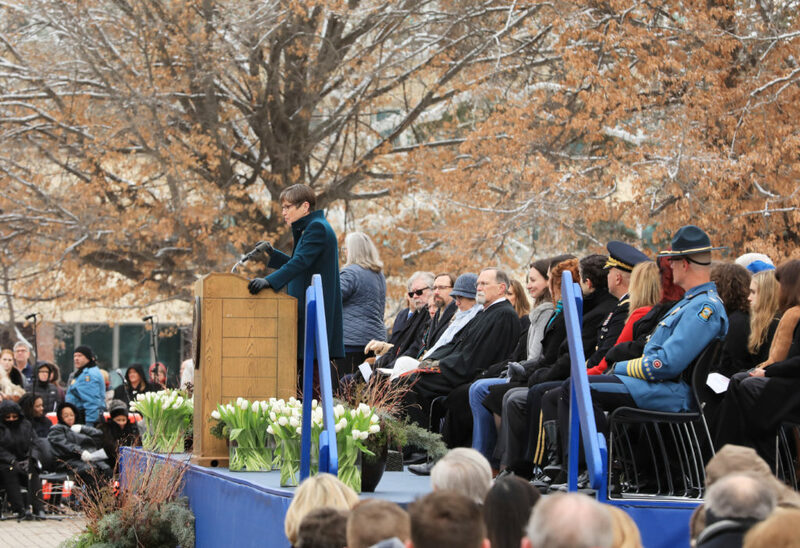 Here is a behind the scenes look at how it all comes together in just a few short months. 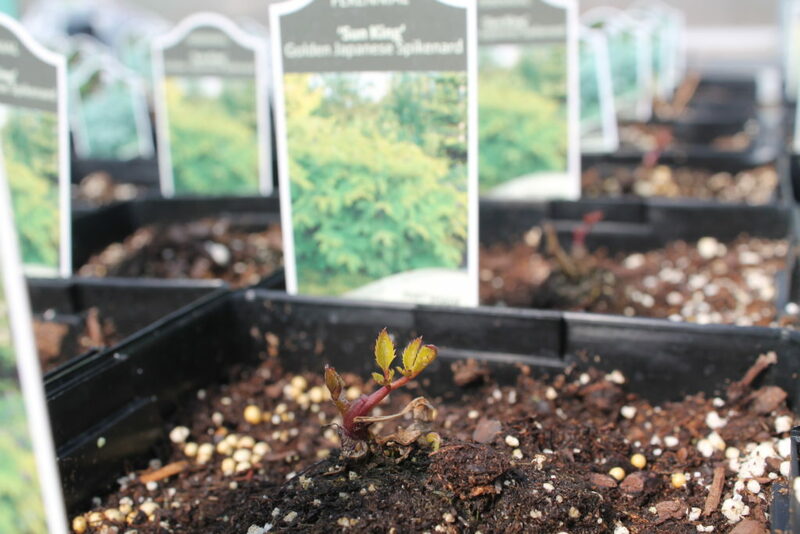 Each spring we receive about 15,000 plants. 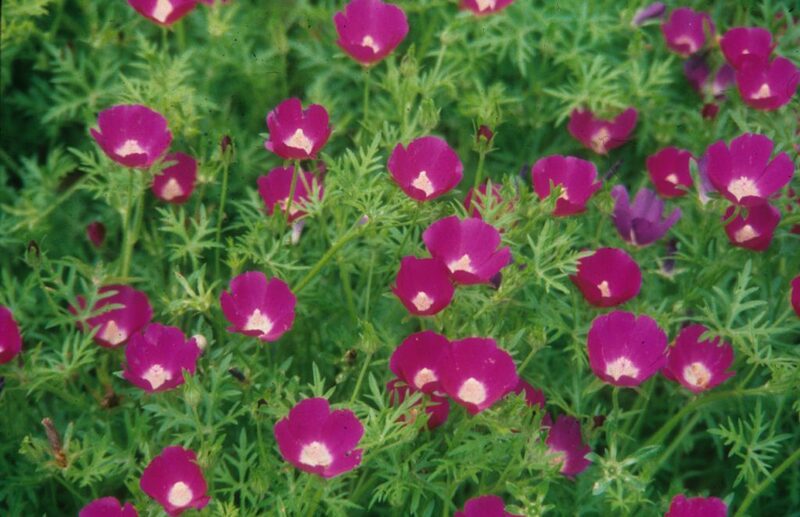 Many plants come to us as plugs — pre-grown plants that are transplanted into sale-size pots. This is an economical and user-friendly way for us to plant thousands of plants without the risk associated with caring for tiny seedlings. 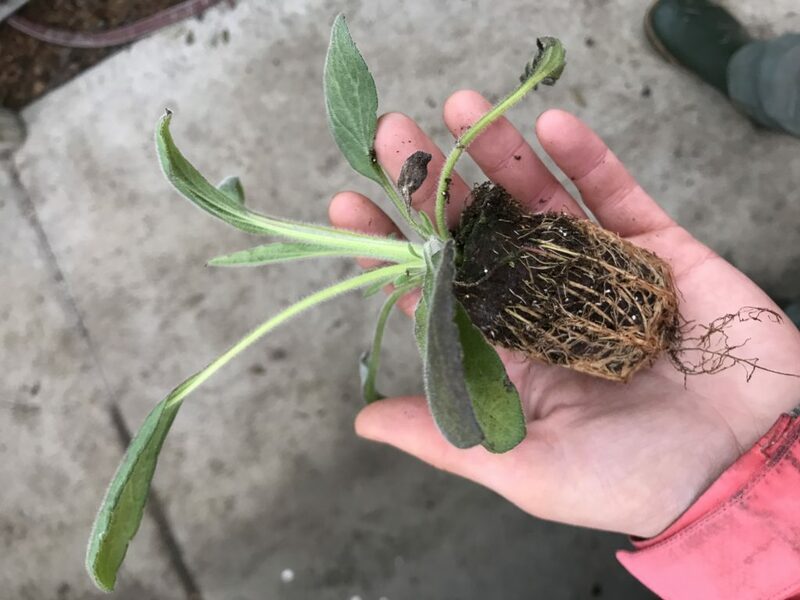 We order plugs from lots of native plant nurseries around the country and around the state to ensure a nice variety for our customers. 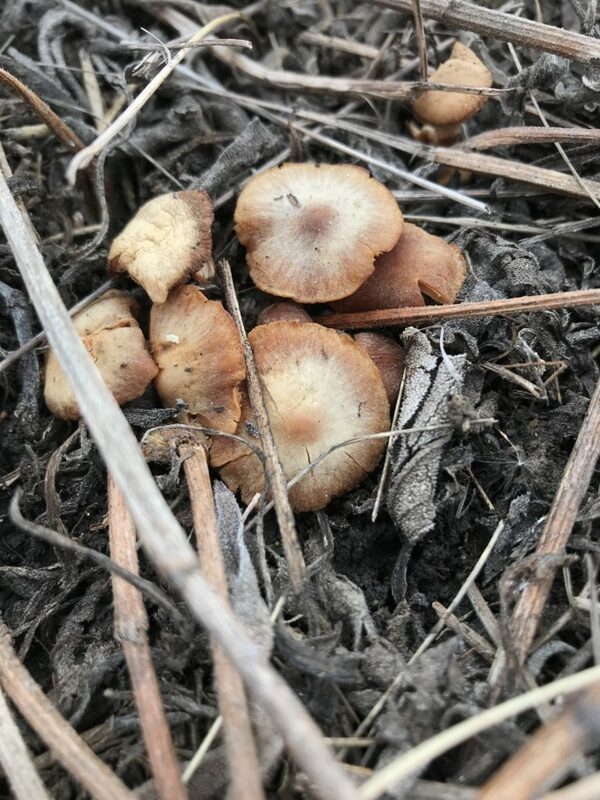 Plugs are small and have fragile foliage, but also have well formed root systems. Plug plants arrive with very few leaves on. With a few days of sun and moisture, they begin to leaf out and grow quickly. Sometimes we seed our own plants with seed we have collected or purchased from a trusted source. Though this is very tedious and time consuming, it is so rewarding to see those little sprouts poking through the soil! We then use a fork to tease apart the tiny roots and plant them into individual pots. 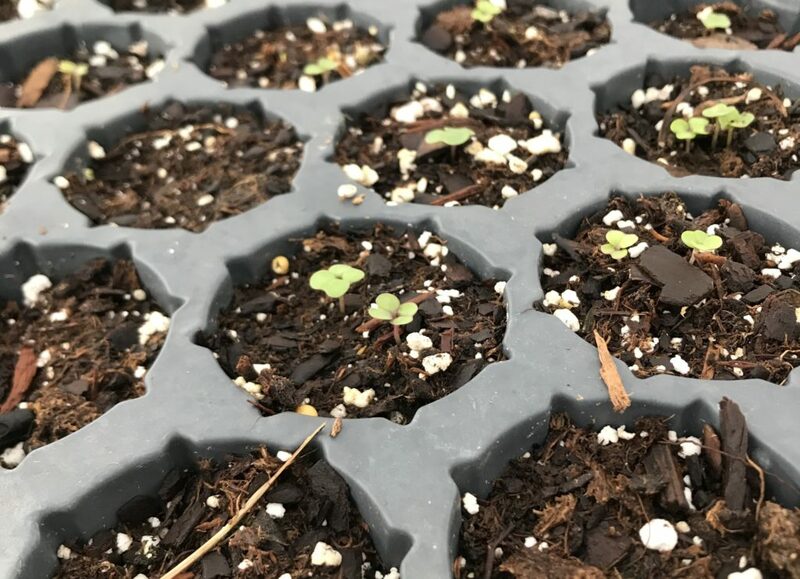 Tiny seedlings are so sensitive to changes in temperature and moisture, so I try not to seed more than I can take care of! In previous years, Scott and Brad seeded much more of the nursery stock than we do today. We heat the greenhouse with industrial heaters during the cold nights of February and March and vent with large fans during the day. 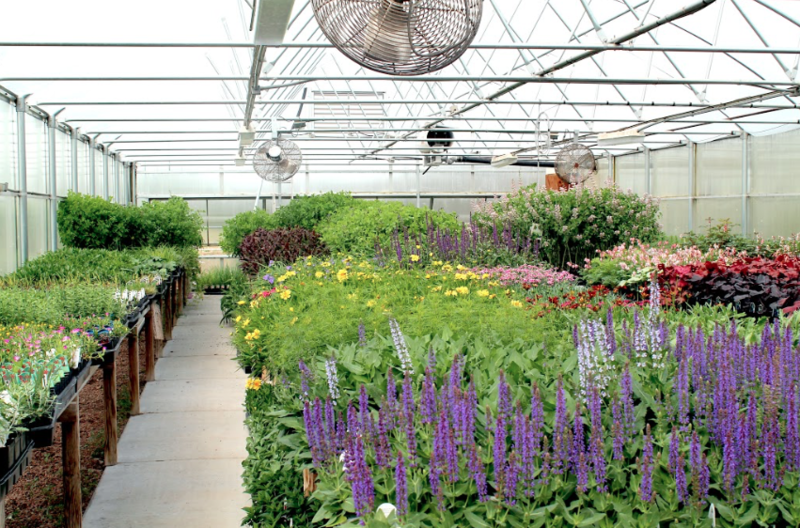 Keeping plants at optimal growing temperature helps them green up in time for the sale. Surprisingly, during a sunny day in spring, temperatures in the greenhouse can reach 90 and 100 degrees Fahrenheit quickly, even though it is cold outside! 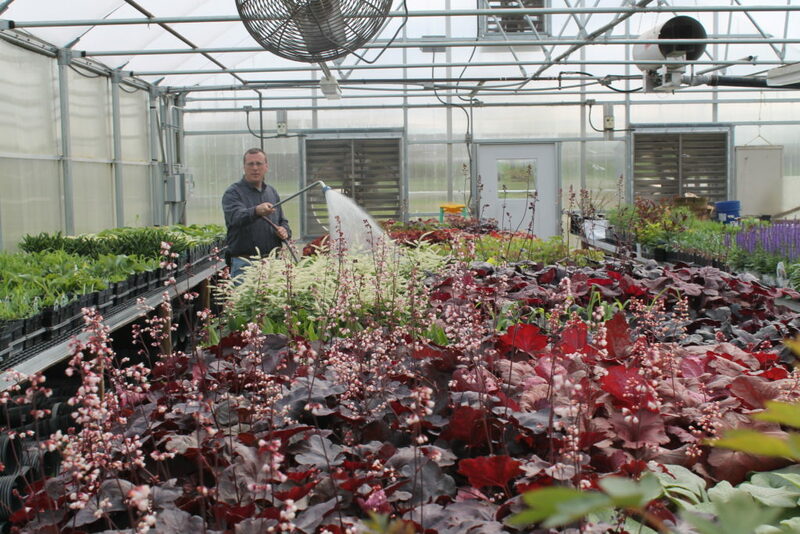 Our director, Scott, waters mature shade plants in our greenhouse. 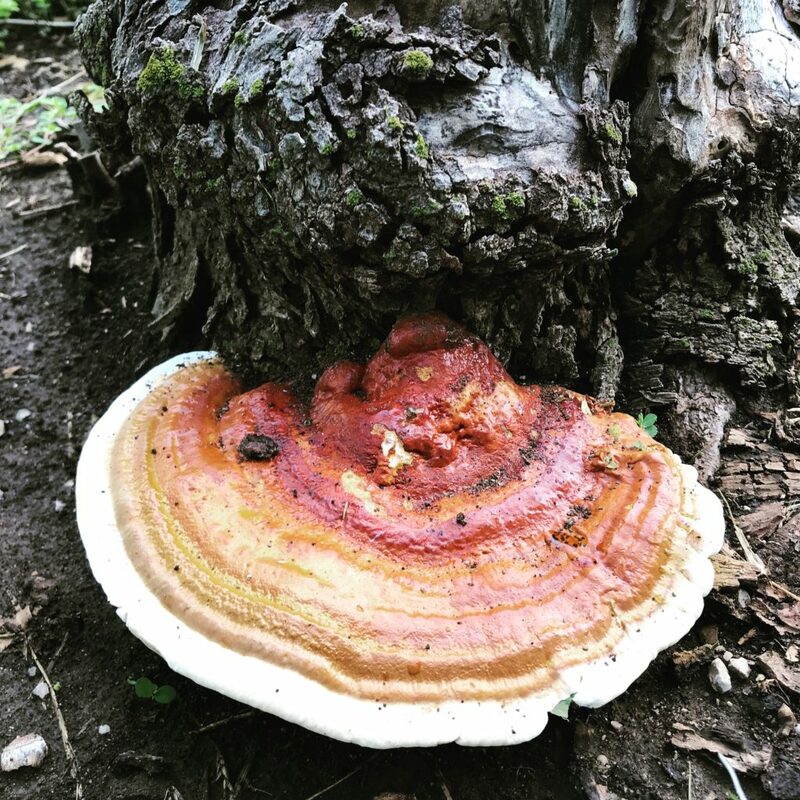 Too much water can mean mold and rot for our plants, but too little can also be deadly! After many weeks of care and worry, my little plant babies are all grown up! FloraKansas would not be possible without volunteers. They transplant, water, sweep greenhouse isles, load and unload trucks, and so much more. I couldn’t possibly do all of those tasks by myself! And that doesn’t even include the many volunteers who help us on the days of the event, cashiering and helping customers to their cars. 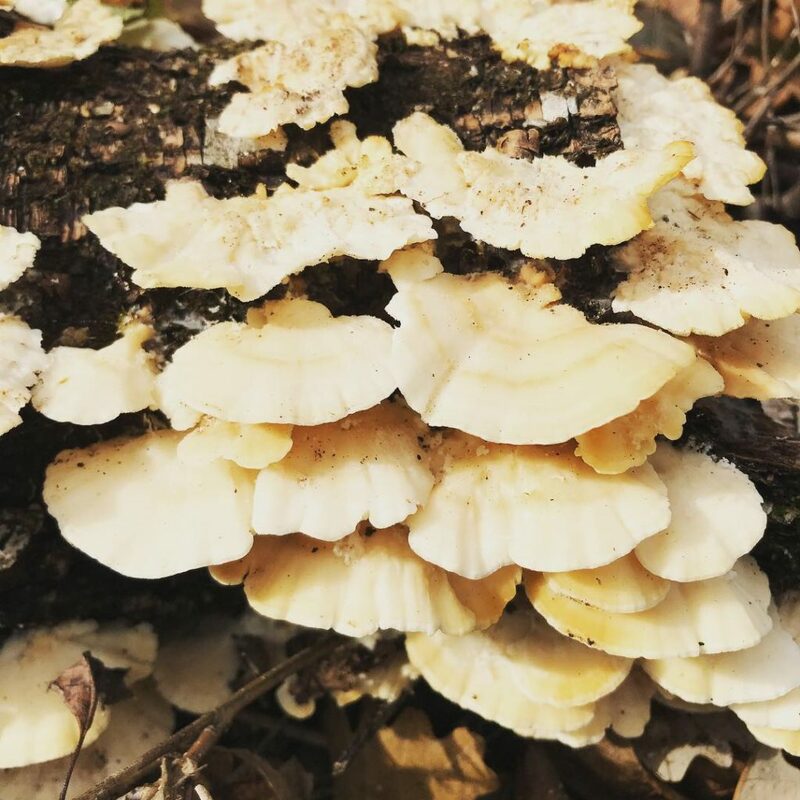 FloraKansas is a great time to be an Arboretum employee — surrounded by enthusiastic volunteers who support our mission, it makes the job easy. If you would like to volunteer at FloraKansas or otherwise, click here for more information. I hope to see lots of our blog readers at the spring sale! 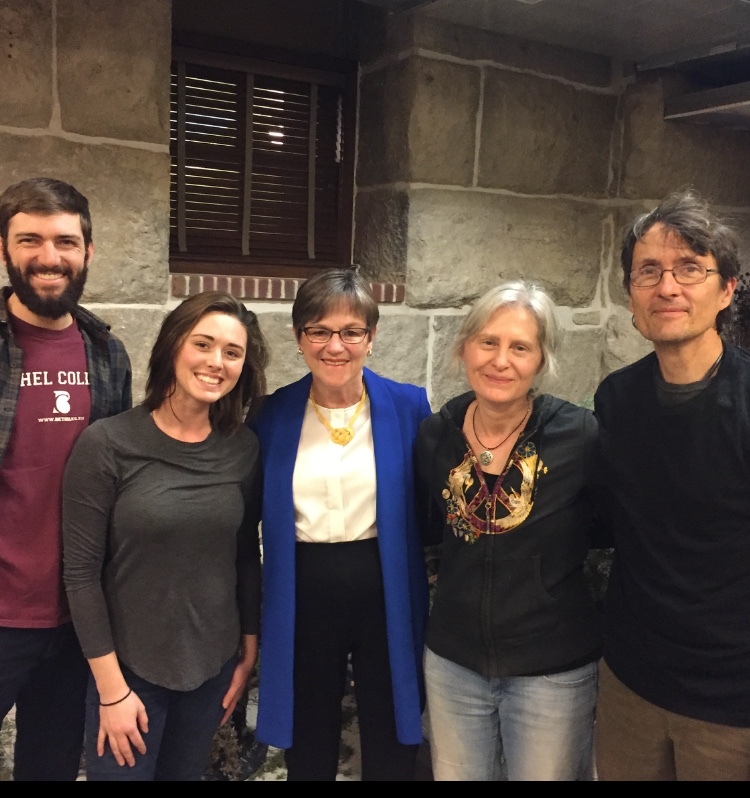 It is a wonderful time to talk face to face with our members and supporters. Come see us soon, and pick up a few native plants while you are at it. This past weekend I cut down a red cedar to use as my Christmas tree; just the right shape and size and with the right amount of character. I feel great about cutting one of these trees out of the wild (an Arboretum staffer condoning tree felling? Yes!). 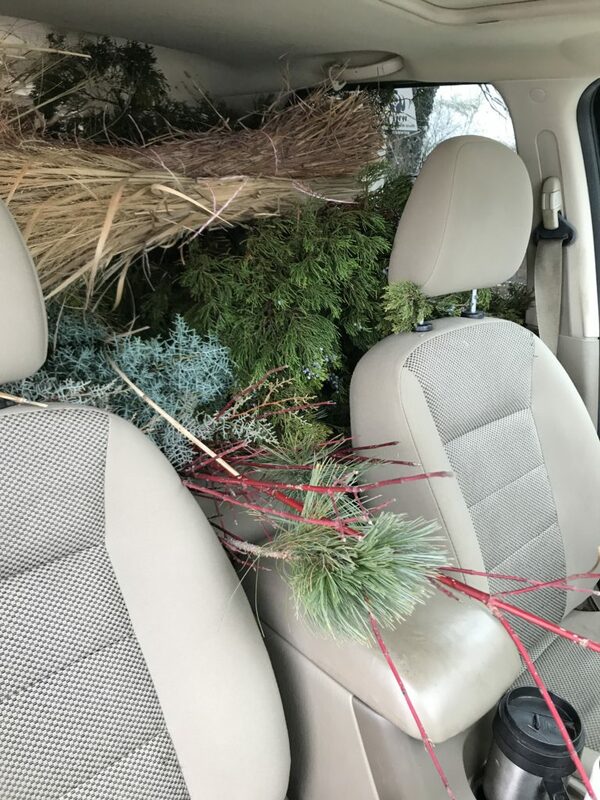 Red cedars are beautiful, strung with lights and tinsel, but they have become a real pest in the Great Plains ecosystem. Here are a few reasons to skip the plastic tree or spruce farm and simply cut yourself a cedar! Any Christmas tree, cedar or artificial, can benefit from some ecologically conscious decorations. Dried grass and seed heads of prairie plants look magical amongst warm white lights, but are biodegradable. Eastern red cedar (Juniperus virginiana) is native to Kansas and much of central and eastern North America. Native though they are, the USDA labels cedars as invasive, and rightfully so. 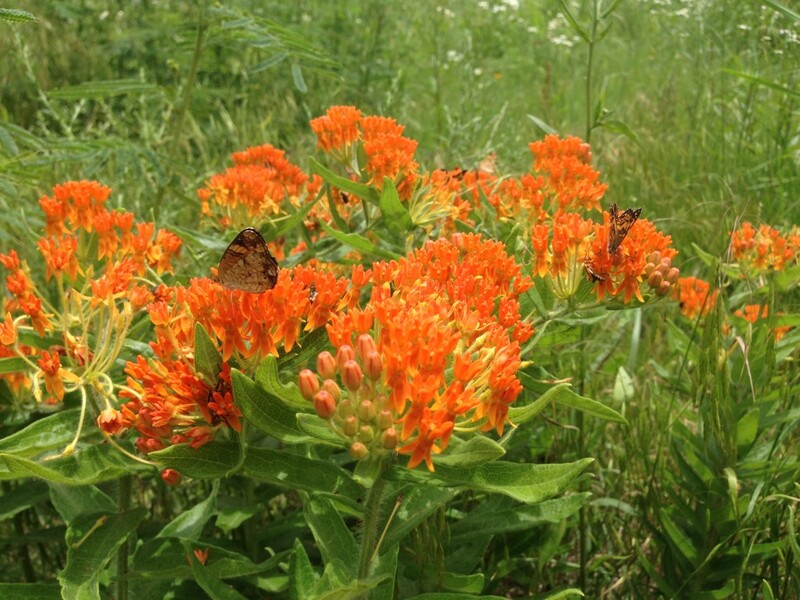 Too many pastures and meadows are overgrown with cedars, choking out native grasses and wildflowers. Without natural wildfires and regular controlled burns, cedars have been allowed to flourish in places that historically would not have been suitable. 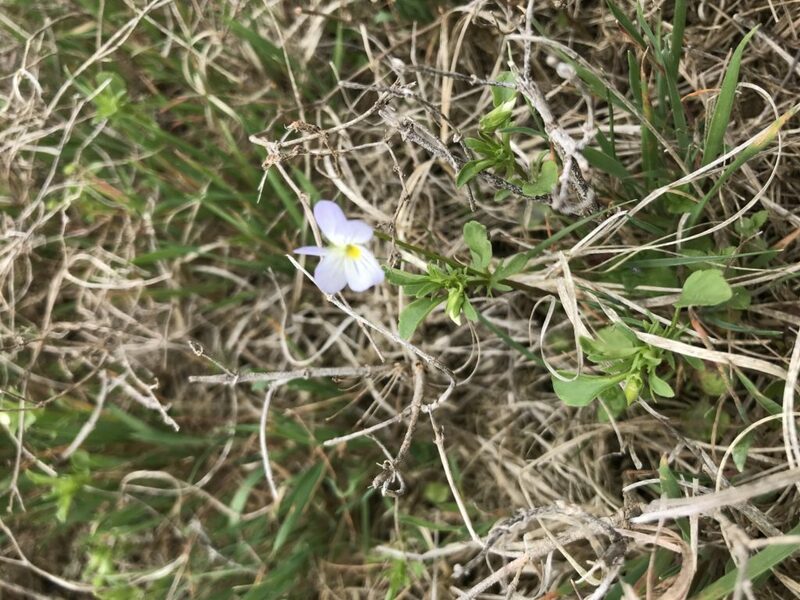 The tallgrass prairie is one of the most rare and endangered ecosystems in the world, and the invasion of cedars upon open grasslands decreases species richness, changes soil composition and even threatens indigenous wildlife. 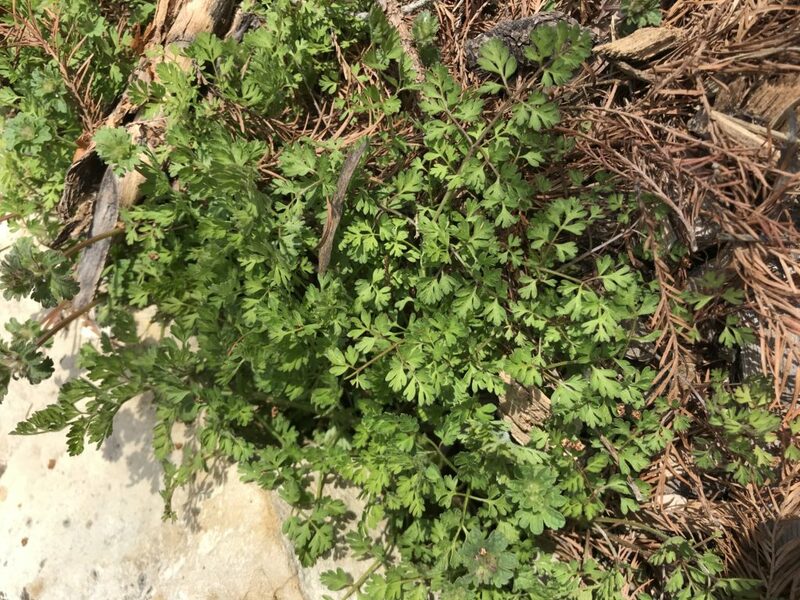 If you are a landowner looking to do maintenance of your grassland or clear it of cedar trees, Dyck Arboretum can provide helpful information. Trees and shrubs are overpopulating grassy landscapes. Randy Rodgers has a wonderful essay here on the impacts of trees encroaching on the prairie. Endangered and vulnerable species like the American burying beetle and the greater prairie chicken are only further threatened by the turnover of grassland to cedar forests. 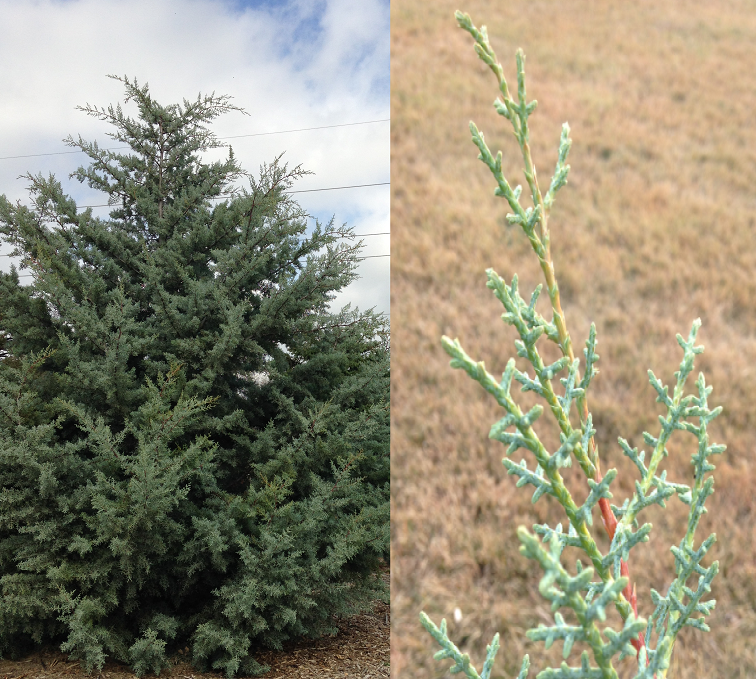 Cedars do have redeeming qualities – winter shelter and forage for birds, drought tolerance and erosion control. Red cedars certainly have their place in a hedgerow or small grove, but should be carefully limited from spreading. Cedar trees make prescribed burning tricky and often exacerbate already dangerous wildfires by sending up massive flames. Overgrown cedar pastures are a serious fire risk, and may have been a factor in the 2015 Anderson Creek wildfire. My coworker Brad has some great bumper stickers that encourage regular prescribed burns to prevent cedar overgrowth. Why don’t we skip all that frivolous resource usage and cut down some of these pesky cedars instead? You can feel good about a tree that’s low on carbon waste but high in old-fashioned, folksy quality. Get permission from a farmer, landowner or your county land management officials before you start cutting. They will likely be happy to get rid of one, and you may get it for free (more money for gifts, yippee!) and enjoy a lovely, cedar-scented home this holiday. Even though the grasses of the prairie are drying up and seed heads are ripening, creeping quietly beneath it all is bee balm – still green and growing. I have stumbled on to quite a bit of it around our grounds as I begin to hang Christmas lights through the gardens. I can tell when I am tromping through a patch of bee balm because of the fresh, minty smell the crushed leaves exude. Extremely hardy and adaptive, monarda species stay green long into fall and early winter. Bee balm is a timeless prairie flower, and an excellent performer in the landscape. 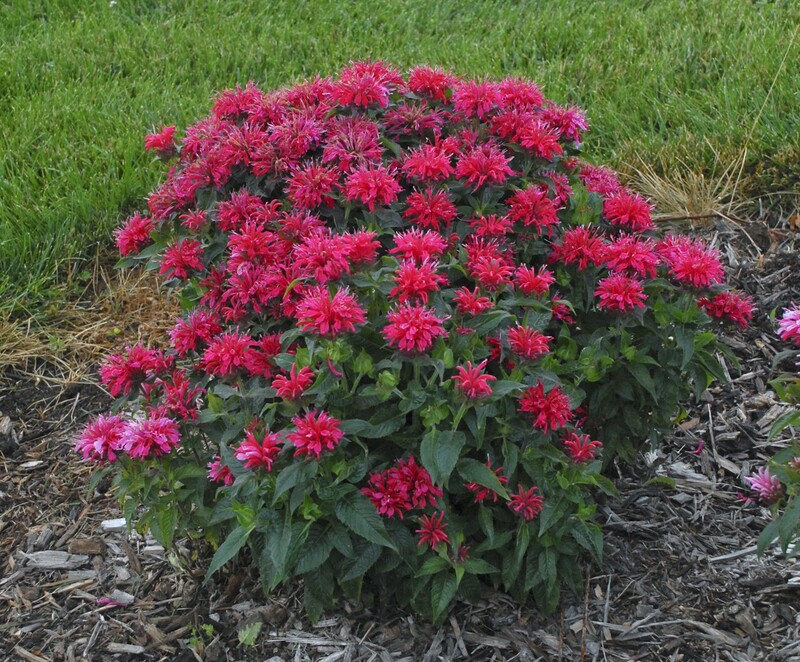 Here are some tips to getting the most from your Monarda! Though bee balm is quite adaptable, each species has its preferences and will thrive in specific environments. Monarda fistulosa, for example, is native to much of North America and thrives in full to part sun conditions. You may have heard this plant referred to as wild bergamot or Oswego tea. This is the species you are most likely to find in the prairies of eastern Kansas. 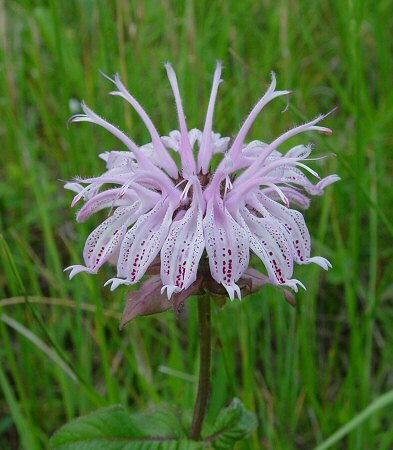 Monarda didyma, however, prefers a much shadier and protected environment. This type of bee balm is native to eastern regions of the US and cannot handle our full Kansas sun. 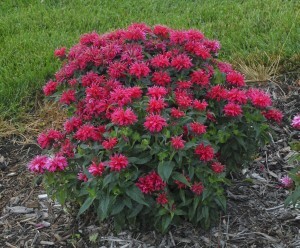 There are countless varieties of bee balm, specially made to fit any color scheme or garden space. 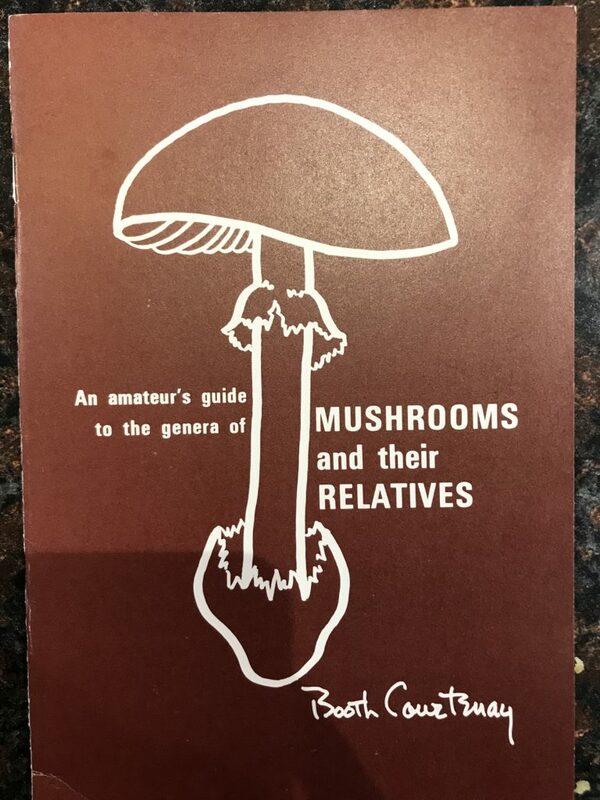 Just be sure to check the parentage of the cultivar to know what its true growth habits are. ‘Cherry Pops’ Bee Balm. 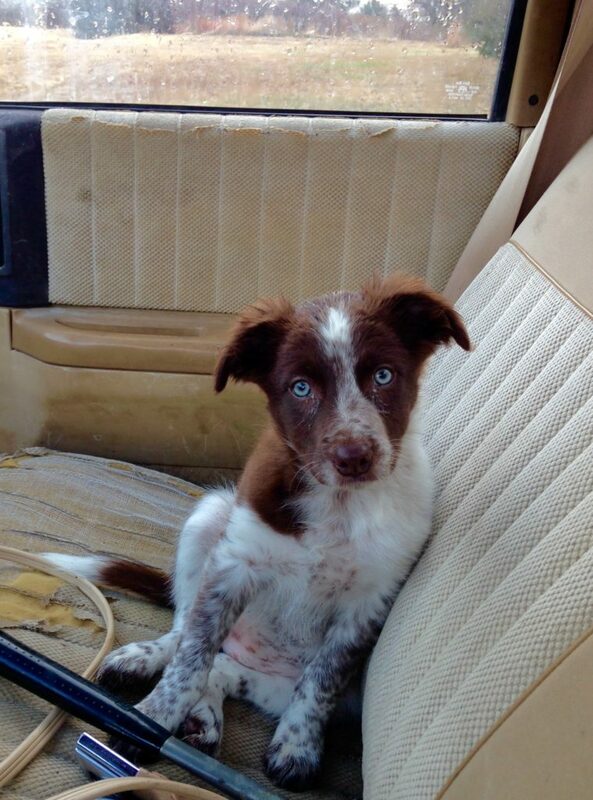 Photo courtesy Walters Gardens. As I mentioned earlier, Monarda species often have common names that refer to its culinary use. It is sometimes called wild bergamot because of its aroma, reminiscent of bergamot orange oil in Earl Grey tea. The use of bee balm as a tea has a long history within the nations of Native Americans, for its pleasant taste and medicinal properties. I have personally had tea made from bee balm growing right here on the Arboretum grounds, and I love the warm, spicy flavor. I have even seen people use the flowers as cake decorations and in salads! 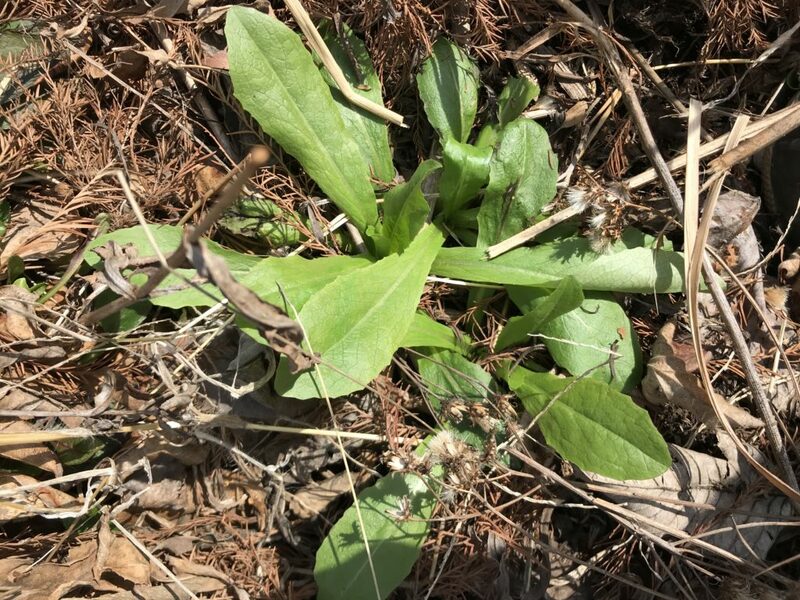 Do your research and be sure you have edible species of bee balm growing in your garden before you decide to make any herbal concoctions of your own. Monarda seed heads in winter add lovely texture to the landscape. One of bee balm’s fatal flaws is its tendency to contract powdery mildew. 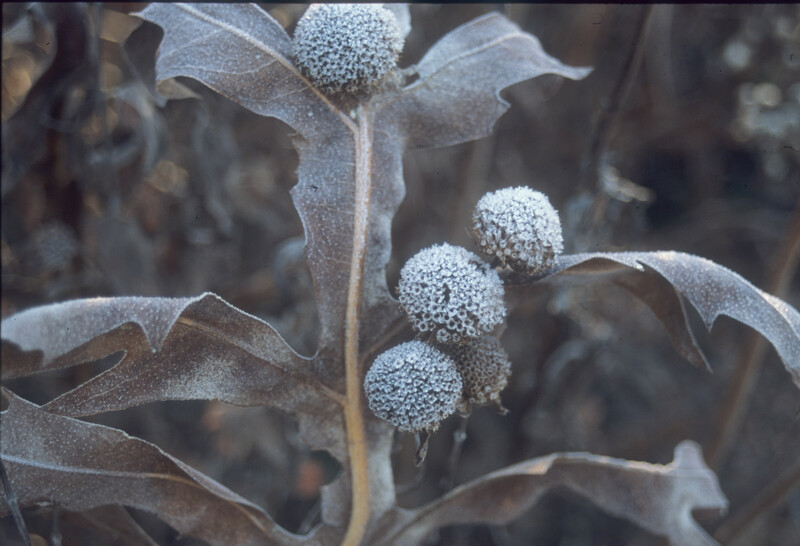 This is a fungal disease that causes the leaves to look as if they have been dusted with powdered sugar. This affliction causes leaves to twist and break off, and can lead to quite a bit of defoliation. 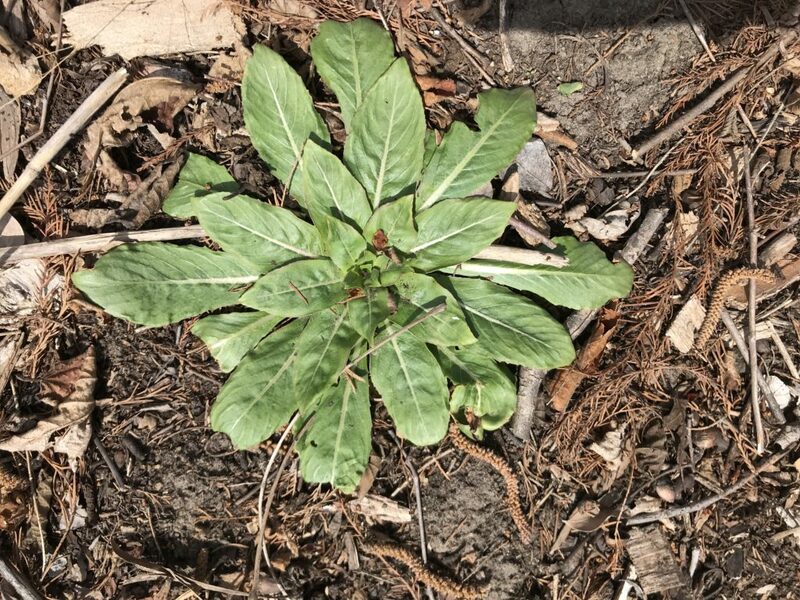 It usually doesn’t harm the health of the plant, but can make it look a little sickly through the growing season. 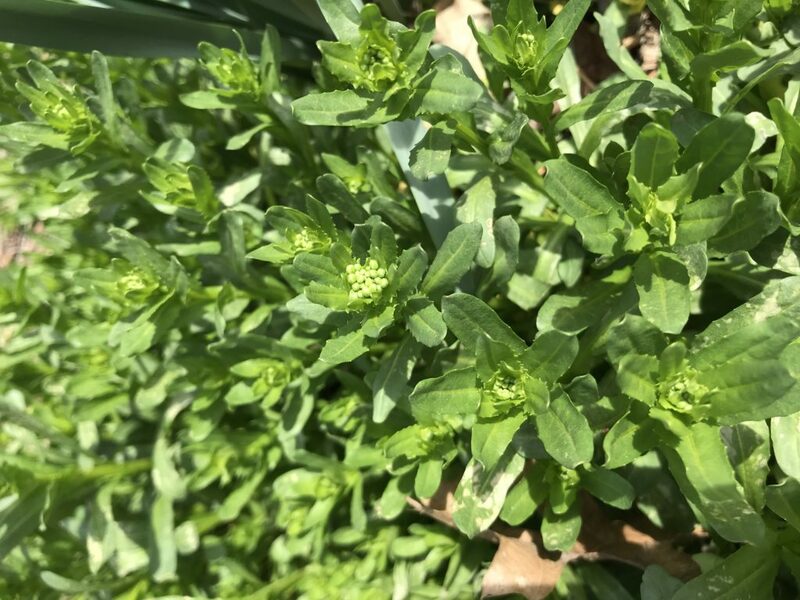 There are lots of ways to treat this issue, from conscientious watering to chemical options, as well as low-cost low-impact homemade remedies. Even though Monarda is so susceptible to this disease, it still stays in my top list of landscape plants because of its floriforus habit, aromatic leaves and pollinator attraction. As you see in the photo above, it even looks nice in the winter when the globe-shaped seed heads make their debut! I enjoy attending my local city council meetings to keep tabs on what is happening in the community, especially in regards to environmental issues. Most city council meetings have a citizen comment session at the beginning or end of every meeting. This is the perfect platform to express your thoughts on community green spaces, roadside prairie preservation and responsible neighborhood development. Letting your local government know you want to see more natural prairie in and around the city could inspire big changes! We say it all the time, but it deserves repeating — Dyck Arboretum couldn’t do what we do without volunteers. If you are passionate about prairie preservation and live in the area, consider volunteering for us! 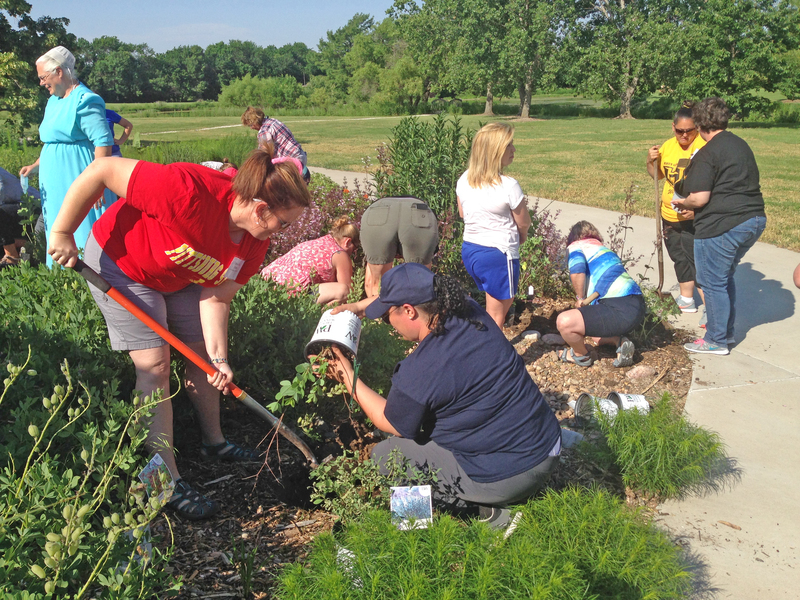 Here at the Arb, volunteers do everything from mow lawns and pull weeds to answer phones and process memberships. When you give your time to an organization, you free up the staff to focus on the heart of its mission and widen its impact. 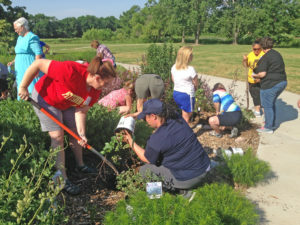 Search VolunteerKansas.org to find a place near you to volunteer your time and advocate for native landscaping, environmental education or sustainable agriculture. Volunteers often help out on the grounds, planting new flower beds and maintaining old ones. They keep the Arboretum looking beautifully managed! Lastly, if you don’t have lots of time in your schedule to attend community meetings or volunteer somewhere, don’t fret. The simple purchase of a membership to an organization you support can make a big difference. The Dyck Arboretum, and other non-profit organizations like us, depend on memberships as a large portion of our budget. Membership gifts also support our programming and events. We use membership numbers to gauge whether our message resonates with the public. It is always so encouraging to see that number grow, one membership at a time! Becoming a member tells us that you support the work we are doing and that you want us to keep it going. 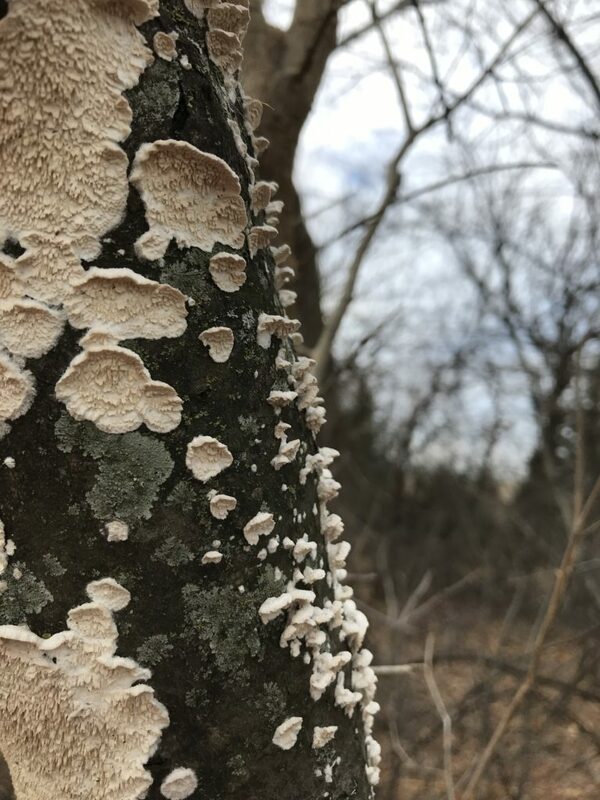 If that is how you feel about Dyck Arboretum, become a member and a prairie advocate here. 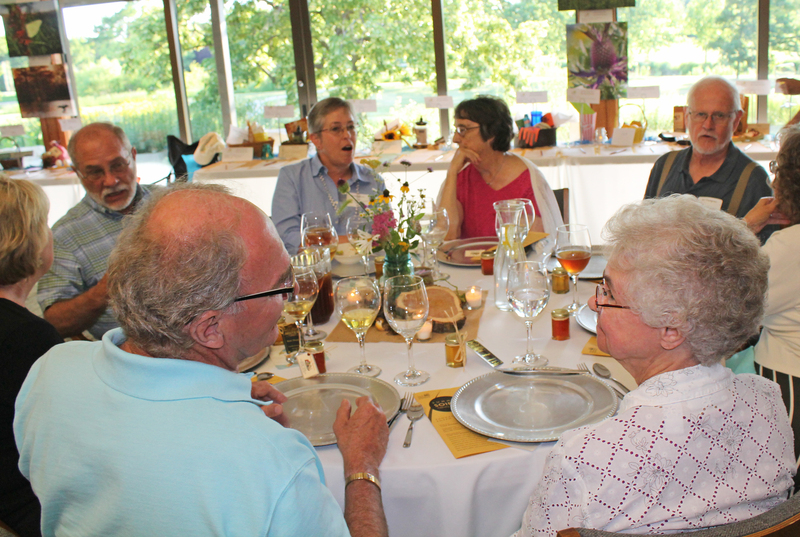 Staff and members get to know each other at the annual Summer Soiree, an evening of fine food and entertainment. Fall is an excellent time of year to go searching for butterflies. The late season flowers like goldenrod, asters, and maximilian sunflowers are all important nectar sources, and are usually swarming with pollinators. If you want to get the most out of your butterfly watching expedition, consider these helpful hints. Grey hairstreaks (Strymon melinus) are my favorite butterfly, even though they are very small and not overly showy. I caught a picture of this one as it fed on wild quinine flowers. Butterflies are most active on sunny, warm days, because they cannot regulate their own body temperature. This is why you don’t see them fluttering around in deep shade – their flight is dependent upon body temperature, which is dependent upon the sun. 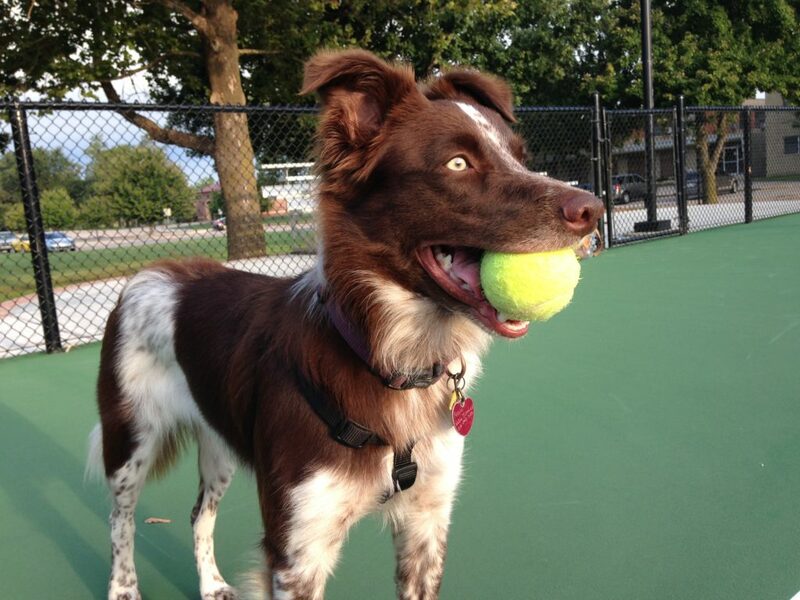 Daytime temperatures between 80-100 degrees fahrenheit are optimum. Anything colder and they will start to slow down or quit flying all together. To warm themselves back up to flying form, they ‘bask’ by spreading their wings and sitting very still on a rock or sidewalk to soak up heat from the sun. For a successful butterfly hunting mission, be sure to choose a warm day and look in areas of full sun. Bordered patches are commonly found throughout the southwest US and Northern Mexico, but I have spotted quite a few in Kansas through early fall. 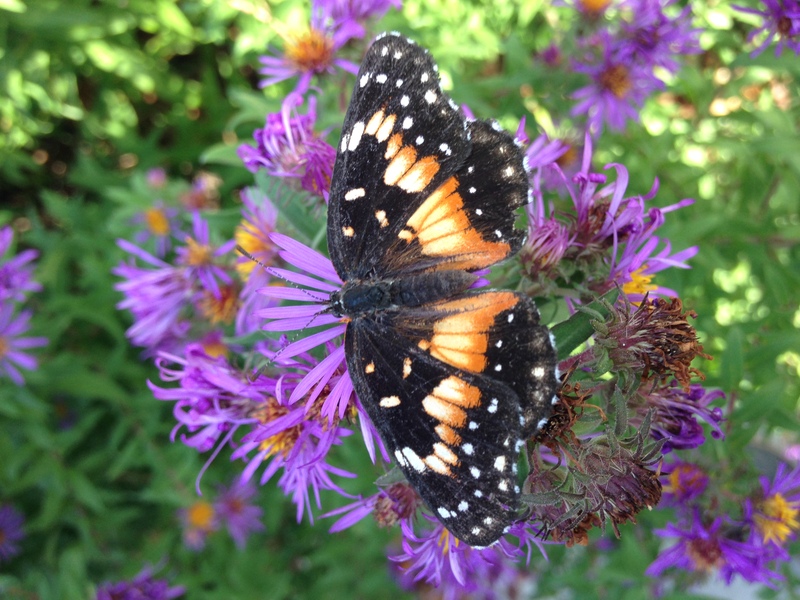 Cold fronts and warm fronts can have a big impact on the kind of butterflies you will see. Earlier this week, a strong south wind stalled several hundred monarchs from continuing their journey to Mexico. Choosing not to waste precious energy and fight the wind, they hunkered down in protected areas of the Arboretum and waited it out. When monarchs gather together in groups and rest on tree branches, they are ‘roosting’. They do this at night as well, or to avoid flying in a storm. Additionally, strong winds can blow in butterflies that aren’t usually in our range or cause otherwise active butterflies to be still, giving you a good opportunity to view them in detail. This video was taken last fall in our butterfly garden. Asters are a great pollinator attractant, as you can see by the monarchs, queens, painted ladies and bees all enjoying their lunch. A pair of good binoculars can greatly enhance your butterfly watching experience and allows you to see details that the naked eye might miss. Short range binoculars, meant for backyard birding perhaps, give you a much more detailed view of nearby butterflies without getting too close and startling them. This can be especially useful when you are butterfly watching with children. Often excitable and loud on these kinds of outings, children can be taught how to use binoculars to keep them at a distance and prevent them from scaring away all your winged friends! This viceroy butterfly is a monarch look-a-like, but is smaller and has a horizontal line on its hindwings that help us tell them apart. Dyck Arboretum is a great place to come for a butterfly watching experience, and we often have many species feeding at once in our butterfly garden area. But it’s easy to attract these beauties to your own home by planting native and adaptable plants that provide food and shelter. We still have a few plants for sale in and around our greenhouse. I’d would love to help you create a butterfly oasis of your own! 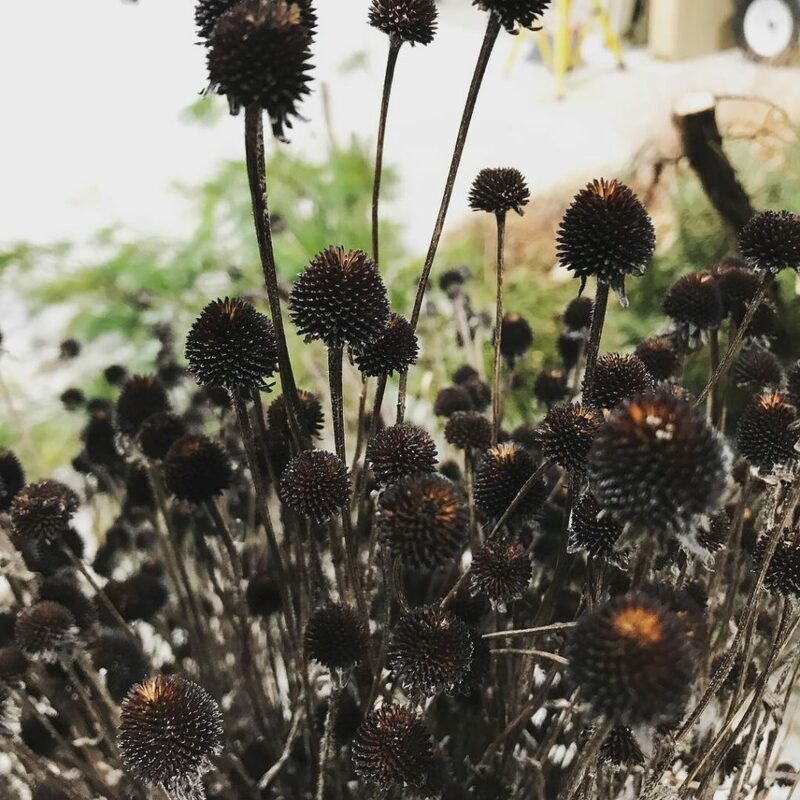 Call the office today and ask about our remaining inventory and special sale items – coneflowers, a butterfly favorite, are 25% off through October 5th. Part II of my blog series about caterpillars will cover their bodies and behaviors, and the habitats you can build for them at home. Once you look closely, you can easily see that caterpillars are more than just a pudgy worm. They often have visible faces, charismatic coloration and interesting behaviors. Caterpillars are actually six legged creatures (because, of course, they are insects! ), though it looks like they have many more. The six real legs are located at the front of the body near the head. All other legs are considered ‘prolegs’; appendages for gripping, and moving, but not true jointed legs. Some caterpillars seem to have horns or antennas visible on their heads, but you are actually seeing tentacles. Most caterpillar antennae are very small and inconspicuous, located near the mouth, while tentacles are large, fleshy and can occur in several places along the top of the body. Tentacles on the head help them sense the world around them while tubercules (fleshy knobs along the body) are usually for intimidating predators. You may have questioned at one time or another how caterpillars ‘breathe’, or if they do at all! In fact, insects breathe through holes in their bodies called ‘spiracles’. These tiny openings (found along the sides of most caterpillars) bring air into the trachea of the insects and usually deliver oxygen directly to the body tissues. 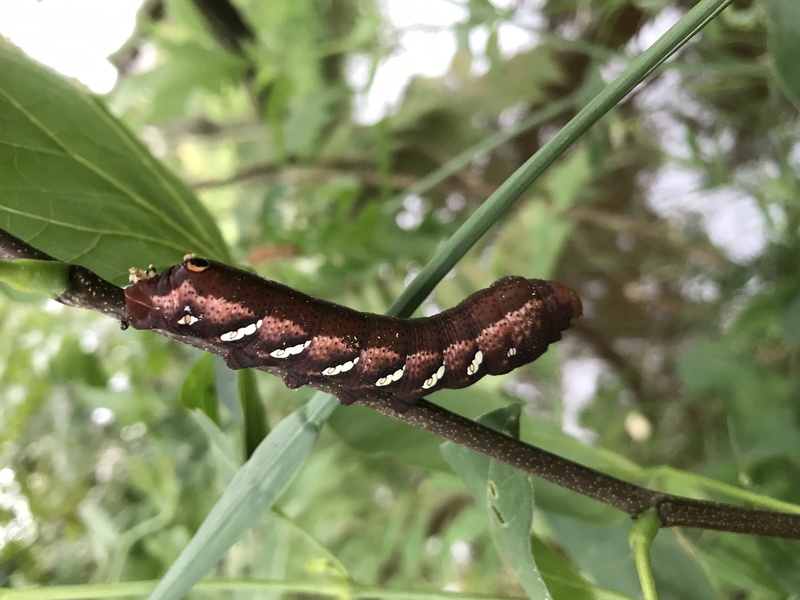 A white-lined sphinx moth (Hyles lineata) caterpillar blending in with a rusty brown redbud stem. As long as my finger at least, this is one huge caterpillar! When you are such a delicious and nutritious snack for birds, it pays to defend yourself and stay hidden! In the last post I discussed defense mechanisms such as special coloration, camouflage or toxic setae (hairs). But sometimes their defenses have much more attitude! For instance, swallowtail caterpillars are famous for their charismatic show of osmetrium, a forked organ that shoots out suddenly to startle predators. When threatened, the caterpillar quickly extends the osmetrium to scare the offending spider, bird, or ant. A great video of this reaction is found here. The organ resembles a snake tongue or tiny horns and can secrete unpleasant odors to further repel a would-be predator. Monarch caterpillar on a swamp milkweed leaf outside the Arboretum greenhouse. 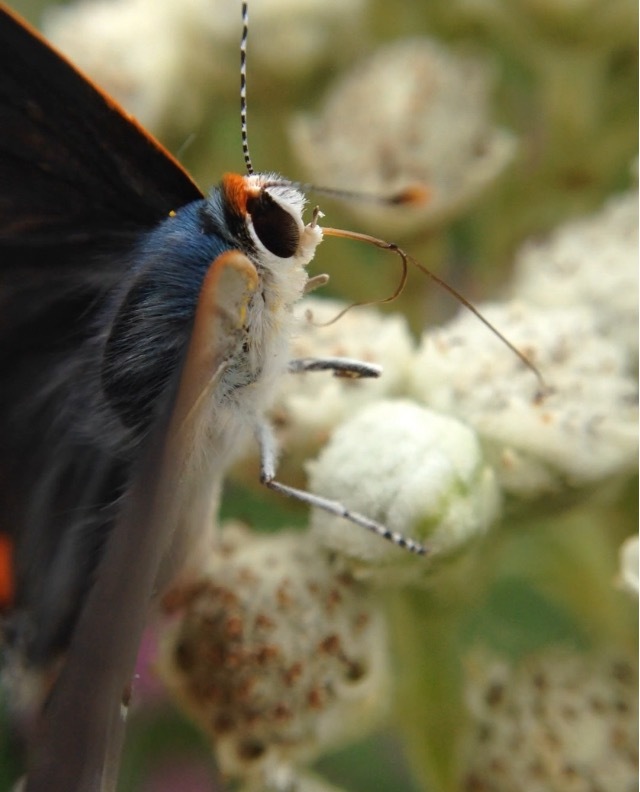 Caterpillars with osmetrium purposely produce unpleasant odors to scare predators, while other butterfly larvae take drastic measures not to produce an odor. Silver-spotted skipper caterpillars are famous for their ability to fling their frass (the fancy word for caterpillar poop) incredible distances. Scientists believe this helps keep predators such as wasps from detecting where the caterpillar is living. To be sure no predator finds their cozy home, a tiny skipper caterpillar can shoot their turds up to 5 feet away! That’s about 30 times their body length. 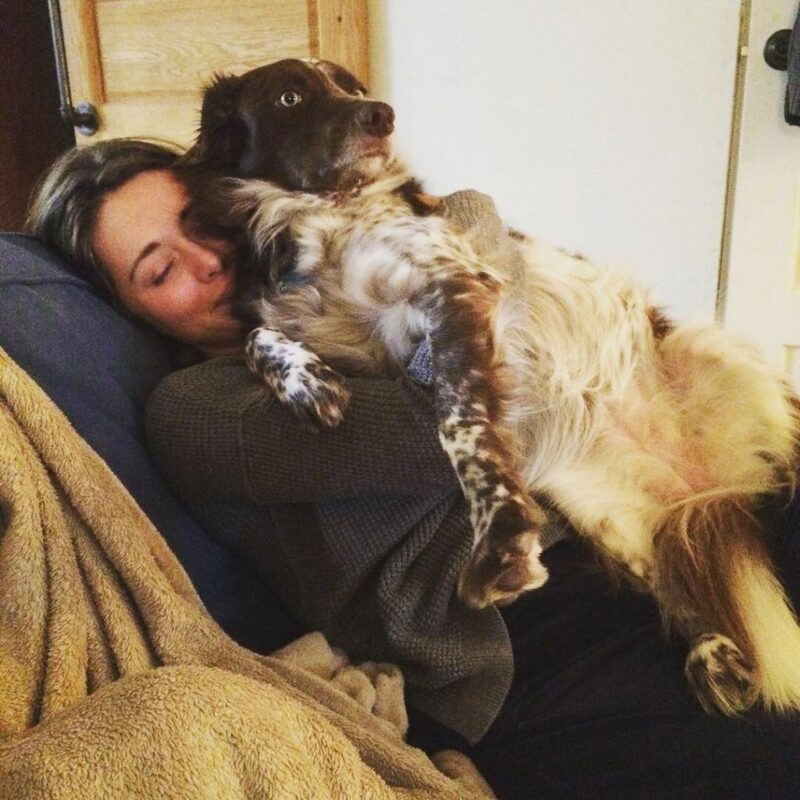 They accomplish this feat through a controlled burst of high blood pressure. Caterpillars have amazing organs called ‘spinnerets’ that produce silk. We know that silkworms are bred especially for their prolific silk production, but many of the caterpillars in your very own backyards also make silk. Some caterpillars use silk to escape predators by attaching it to a leaf and ‘bungee jumping’ to safety. They also use it to make mats or trails around the plant they live on to make travel easier. 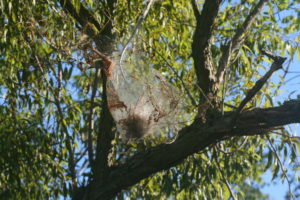 Some caterpillars will make elaborate tents or ‘bags’ out of silk, with hundreds of their kin inside with them. And when it comes time to mature into a butterfly, a silk ‘button’ helps the chrysalis hang from a leaf or twig. Moths make their entire cocoon out of silk, surrounding themselves in a soft yet protective barrier. Regular visits to the Arboretum will provide ample bug-watching opportunities, and our staff are eager to chat with you. But the best way to learn about insects is to see them in person. 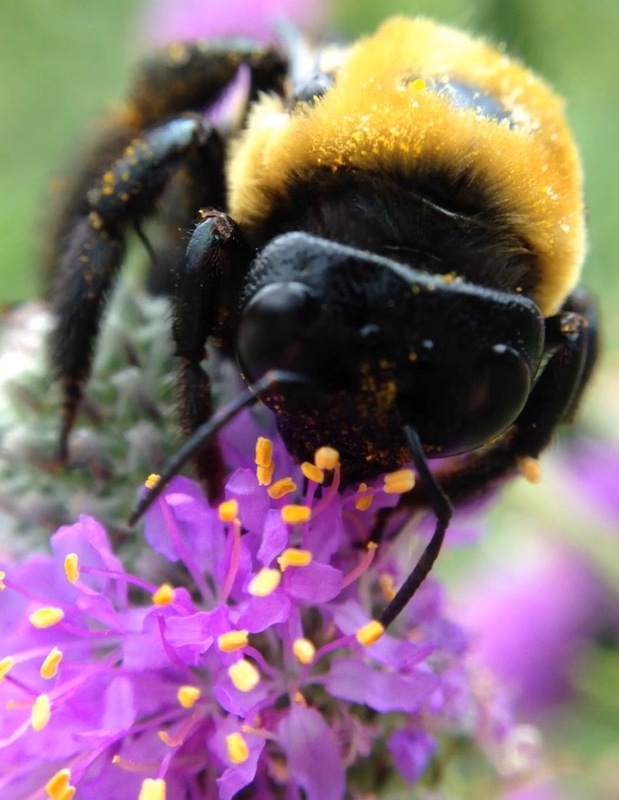 Plant a native garden of your own where insects can thrive! 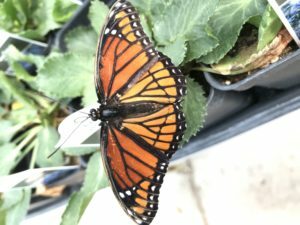 Lots of wonderful resources exist about butterfly gardening, but remember: it isn’t a butterfly garden unless it includes host plants. 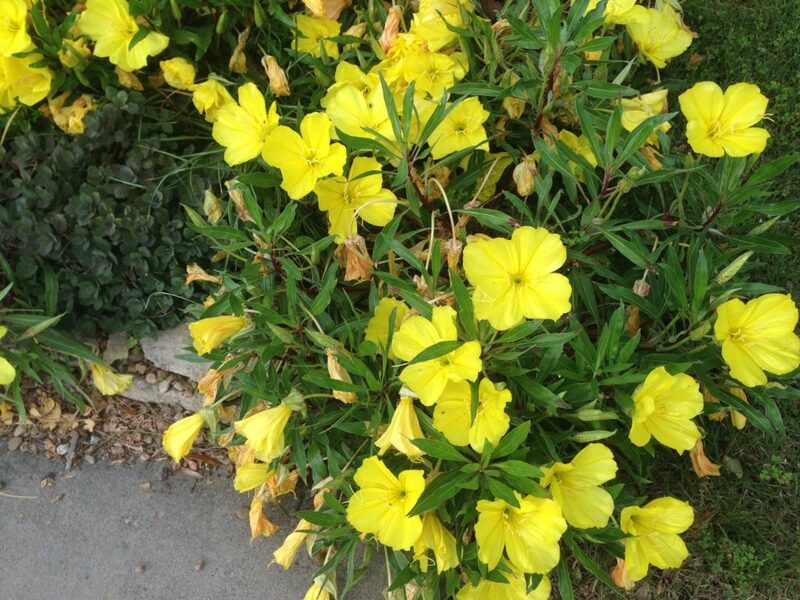 They need host plants (the specific plants the larvae feed on) and native nectar to sustain their entire life cycle. Otherwise, as Lenora Larson might say, you are just “bartending”, serving only “adult beverages” to the butterflies but not supporting the larvae. 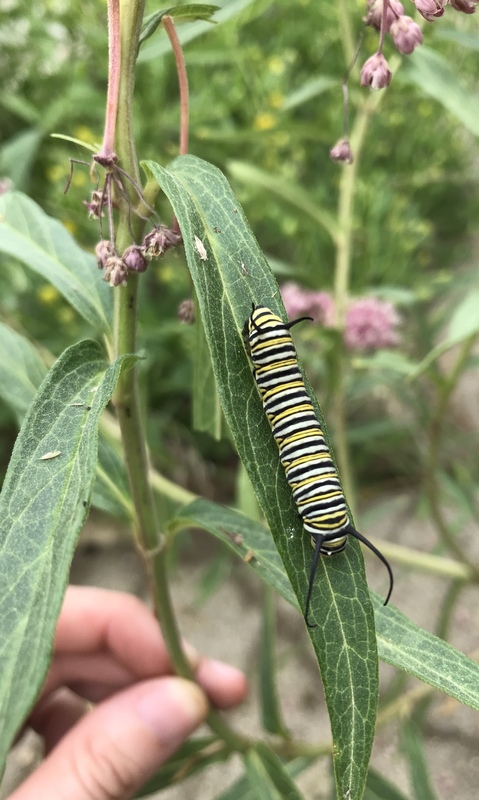 If you need some inspiration to create your own native garden paradise for butterflies and moths, talk with one of our staff members at the upcoming FloraKansas Native Plant Festival!